Cliven Bundy arrested in Portland, Oregon. 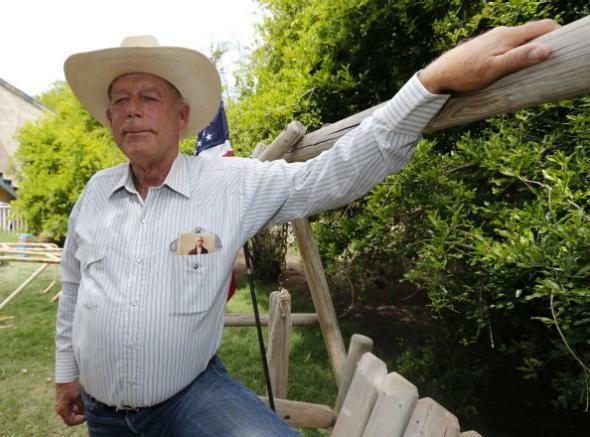 Rancher Cliven Bundy near Mesquite, Nevada, in April 2014. Rancher Cliven Bundy was arrested and jailed in Portland, Oregon, on Wednesday night after flying to Oregon with the intention of traveling to the area of the dwindling occupation of the Malheur Wildlife Refuge, reports say. Bundy is charged with conspiracy to interfere with a federal officer for his actions in April 2014, when he led an armed standoff with federal agents in Nevada that was related to his refusal to pay fees for grazing cattle on public lands. Two of Bundy’s sons, Ammon and Ryan, were involved in leading the Oregon protest/occupation and were arrested in January. Ammon Bundy’s lawyer, Mike Arnold, said Cliven Bundy was considering joining Nevada Assemblywoman Michele Fiore at a news conference that had been planned Thursday morning in Portland to talk about the refuge takeover. [But] almost immediately after she arrived in Portland, Fiore started talking to the last occupiers by phone and left in a car for the six-hour drive to Burns to help work out their surrender. The four holdout protesters who remain on the wildlife refuge spent Wednesday night live-streaming their surreal discussion about how to respond to the FBI agents who have moved on to the refuge grounds; the holdouts ultimately agreed to turn themselves in this morning but haven’t done so yet.